With the launch of Siren Chic Accessories quickly approaching, we are proud to celebrate with a pre-launch giveaway. 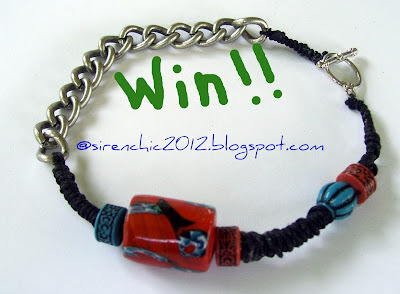 A lucky reader is going to be one of the first to have a "chains and beads" toggle bracelet from our tribal collection. Entering is simple. 1. Follow us on either Twiiter or Facebook. Or just click on sidebar buttons. 3. Leave a comment for this post. Be sure to include your Facebook or Twitter handle so that we can contact you if you win. Good luck guys!! We are so excited about this one.